The United Nations (UN) is an intergovernmental organization aimed at promoting peace, justice and sustainable development through cooperation between nations. It was established on 24 October 1945 after World War II in order to prevent another such conflict. Its roots lay in the League of Nations which had collapsed just before the start of that war. The UN has almost 200 members. Its headquarters are in Manhattan, New York, and also has main offices in Geneva, Nairobi, and Vienna. The organization is financed by assessed and voluntary contributions from its member states. Its objectives include maintaining international peace and security, promoting human rights, fostering social and economic development, protecting the environment, and providing humanitarian aid in cases of famine, natural disaster, and armed conflict. 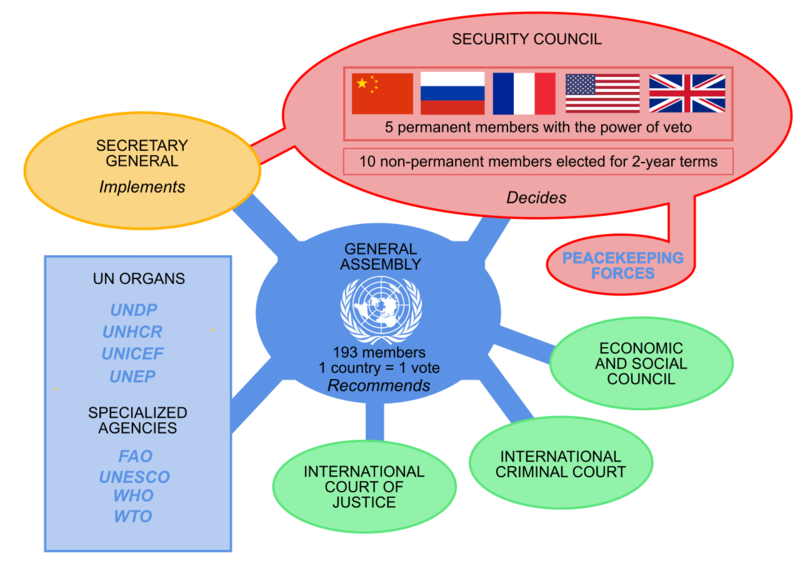 The UN has five active principal organs: the General Assembly, the Security Council, the Economic and Social Council (ECOSOC), the Secretariat and the International Court of Justice. UN agencies include the World Bank, the World Health Organization, the World Food Programme, UNESCO, and UNICEF. The UN’s principal officer is the Secretary-General.